JACKSON HOLE, Wyoming (November 2017) – Top-rated river outfitter Mad River Boat Trips has elevated its highly rated whitewater river-rafting experience by bringing Executive Chef Ty Hess on board to prepare guests’ meals. Hess will prepare fresh, ingredient-driven and ever-changing menus at the tour company’s riverside dinner site, bringing 17 years of professional culinary experience working in world-class restaurants to the banks of Wild and Scenic Snake River. The 2018 season begins May 15. Riverside buffet-style meals are part of Mad River’s whitewater rafting experiences down the Snake River, which will become the highlight of any trip to Jackson Hole. Professional, experienced river trip guides navigate rafters through the twists and turns of Snake River Canyon while pointing out flora, fauna, geology and aspects of the region’s history that make this area unique. Mad River Boat Trips offer runs through class II and III rapids, making them appropriate for guests ages six and older. Guests will grab their paddle and shoot the rapids with Mad River’s experienced and professional guides. Chef Hess’s cuisine hails from the Low Country of Charleston, S.C., where he studied culinary arts. He brings this Southern influence out West and adds a regional note by using fresh, local ingredients. Tempting menu items may include: Curry Crusted Utah Steelhead Trout; Sautéed Farro “Ragout” with shallot, parsley, scallion, currants and extra-virgin olive oil; Balsamic Grilled Asparagus and Dutch-Oven Berry Cobbler; Grilled Barbecued Chicken thighs, Honey-Glazed Heirloom Carrots with local honey, parsley and cracked pepper; Summer Melon; Tangy Mint and Fennel “Slaw,” Jalapeño Skillet Corn Bread and Cinnamon Rolls; Grilled Bavette Steak with Horseradish Cream; Grilled Butter-Poached Corn; Sautéed Winter Greens with citrus, chili flake and cider vinegar and Chef’s Buttermilk Biscuits. Prior to joining Mad River Boat Trips, Chef Hess’s combined love of cooking and the outdoors inspired his career path working in some of the country’s most beautiful resort destinations, including Utah’s Solitude Mountain Resort and The Aerie at Snowbird. Most recently, he served as executive chef at Bighorn River Lodge in Montana. You can watch Chef Hess in action preparing riverside meals here. To check schedules and make reservations, go to www.Mad-River.com or call (800) 458-7238. Mad River Boat Trips is a river outfitter in Jackson Hole, Wyoming, and consistent recipient of TripAdvisor’s “Excellent” rating by its customers. 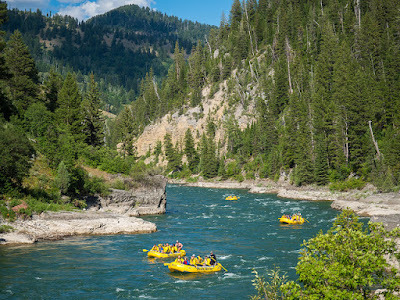 Offering whitewater trips and scenic floats daily during summer since 1977, Mad River offers guests extraordinary recreation on the recently designated Wild and Scenic Snake River. The Snake River begins its journey in the rugged backcountry of Yellowstone National Park and gathers water as it heads south toward Jackson Hole through Grand Teton National Park. The river exits the south end of Jackson Hole through the winding Snake River Canyon, lined with trees and steep granite walls, small alpine meadows and abundant wildlife. It’s on this section of the Snake River where guests travel down a wild and scenic river, which is a rarity in the Rocky Mountains—it’s an experience not to be missed. For more information, visit www.Mad-River.com or www.Facebook.com/MadRiverBoatTrips. Mad River is a permittee of the Bridger-Teton National Forest/Equal Opportunity Provider.